I downloaded this piece of software earlier after a few people had mentioned it to me. I need to take a closer look at it before I make my mind up as to how useful it is. 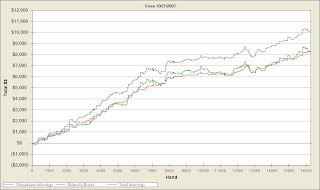 Anyway, here's a couple of graphs of my last four days play as requested by Eternal from the 2+2 forums. 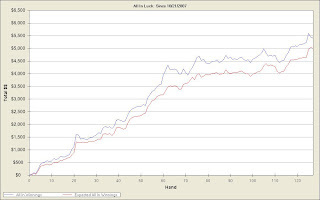 The first one demonstrates that you are making money all across the board both from non-showdown hands and also from showing down the better hand. You'll quite often have players with nice positive read and blue lines confirming that they put their money in good in terms of bets and calls but the green line is way lower. This means that they lose too many pots when they don't go to showdown. Your luck graph confirms you are running a little above expectation with your all in pots but in the grand scheme of your profits for this period its a drop in the ocean.